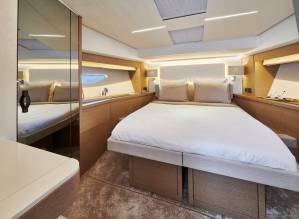 Prestige Yachts announces the arrival of the new Prestige 590 Fly. Prestige Yachts announces the arrival of the new Prestige 590 Fly this fall. The French shipyard Jeanneau announces the launch of the Prestige 590 for the next Cannes Boat Show (this fall), and for us North Americans, the boat will be present for the Fort Lauderdale Boat Show 2018 edition from Oct. 31 to Nov. 4. This new Prestige 590 model completes the flybridge model range from the top. 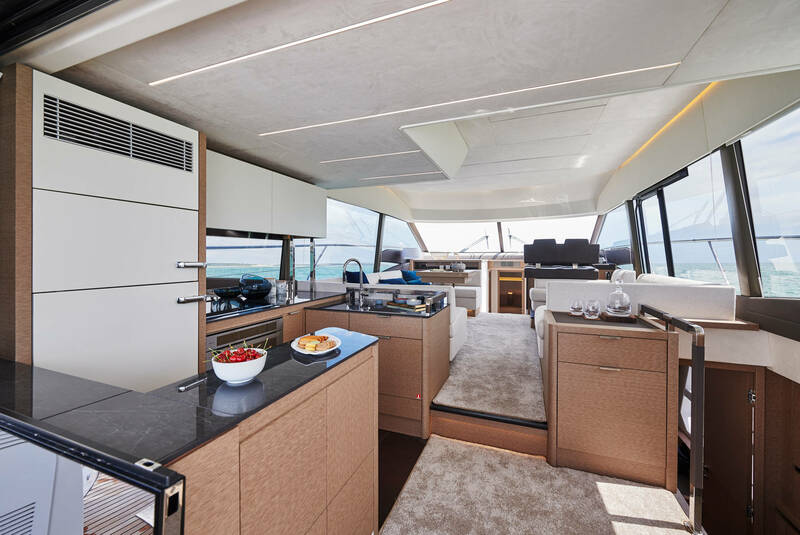 The Prestige 590 adopts the latest styling evolutions of the brand (seen on the new 520 for example), with larger glazing especially at the first bridge and a significant width with its 15 ft 10 in. 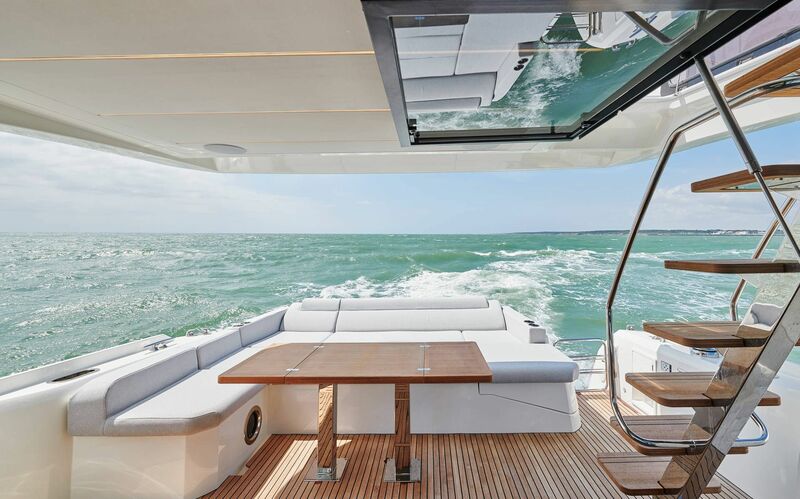 With the widest Flybridge in its range (Prestige), the Prestige 590 offers a multitude of relaxation areas. 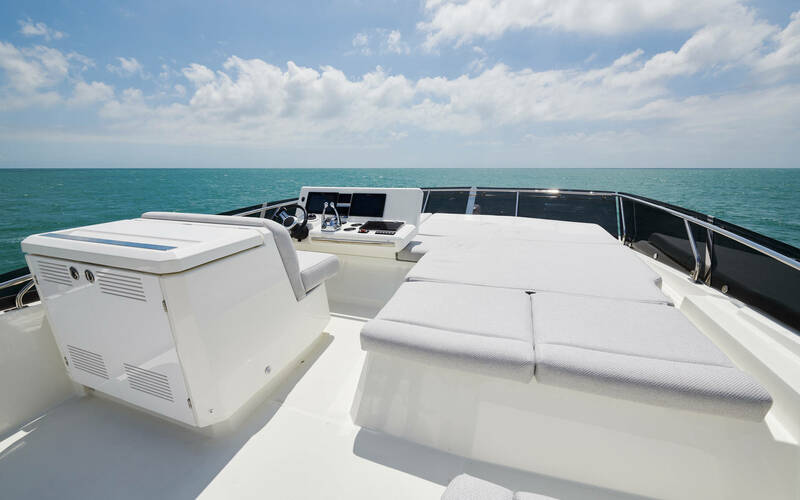 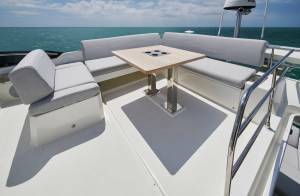 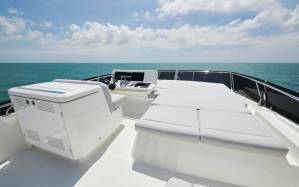 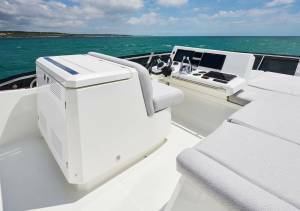 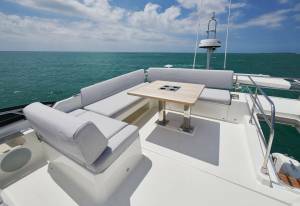 On the front deck is a large sunbathing area, a bit like the one on the Prestige 680. Totally adaptable to the desires of the moment, this space has, of course, a table. 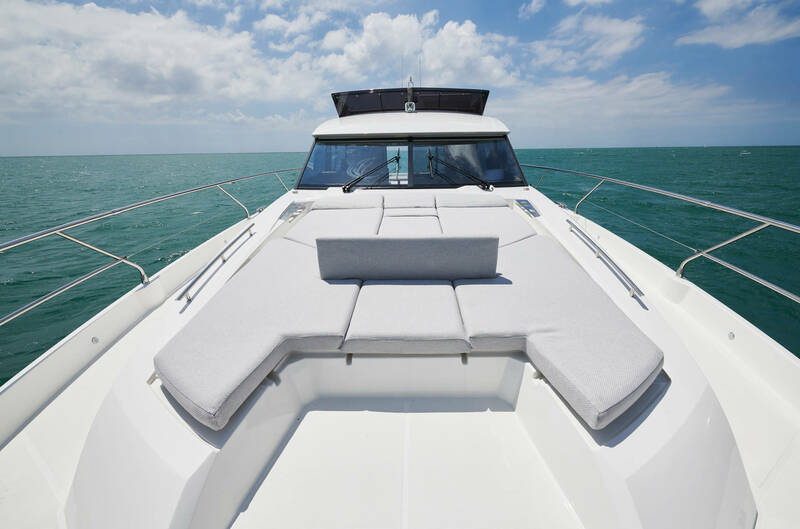 It is also possible to deploy a bimini for a sun shelter thanks to four carbon pillars. 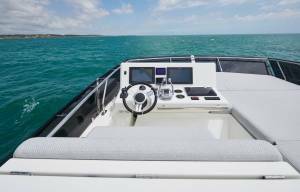 The aft cockpit offers some of the most successful amenities. The L-shaped seat consists of modern sofas, rounded and very comfortable. The rear offers a cabin version for two sailors (crew cabin) with a mirror glass all along the transom. 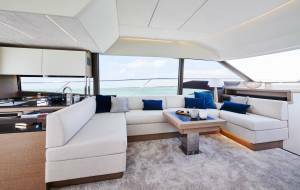 In its configuration equipped with a garage for the dinghy, the cockpit bench becomes a real sunbathing area for relaxation. 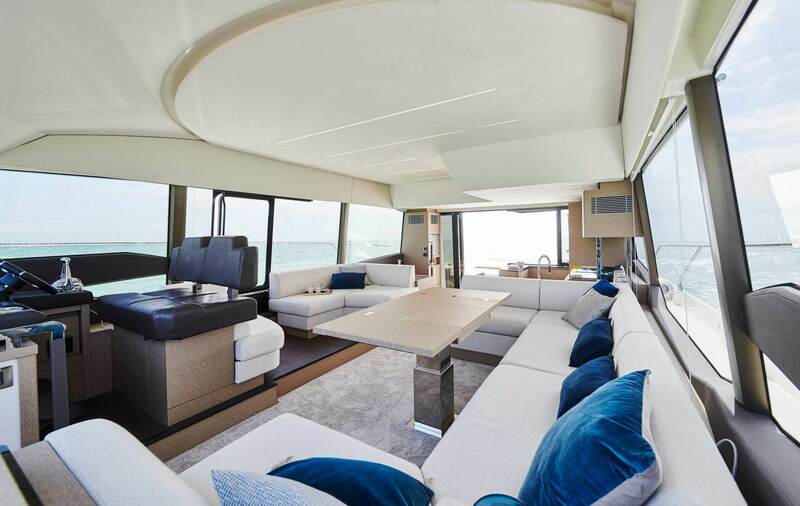 And to finalize, there is a hydraulic platform and integrated bridge. The Prestige 590 confirms the brand’s know-how in terms of comfort and luxury that has appealed to a large number of yachtsmen. 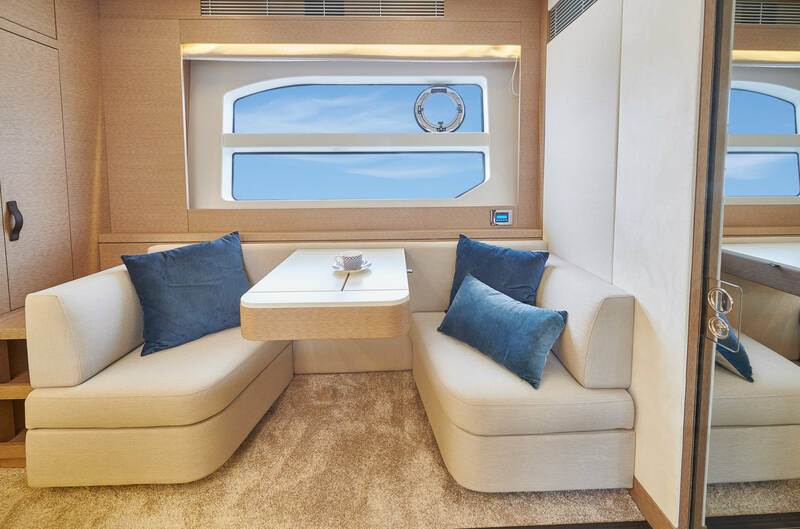 The Flybridge allows you to enjoy a pleasant place to live with multipurpose spaces. 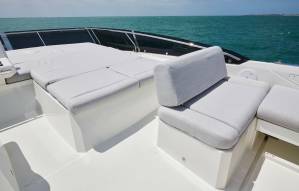 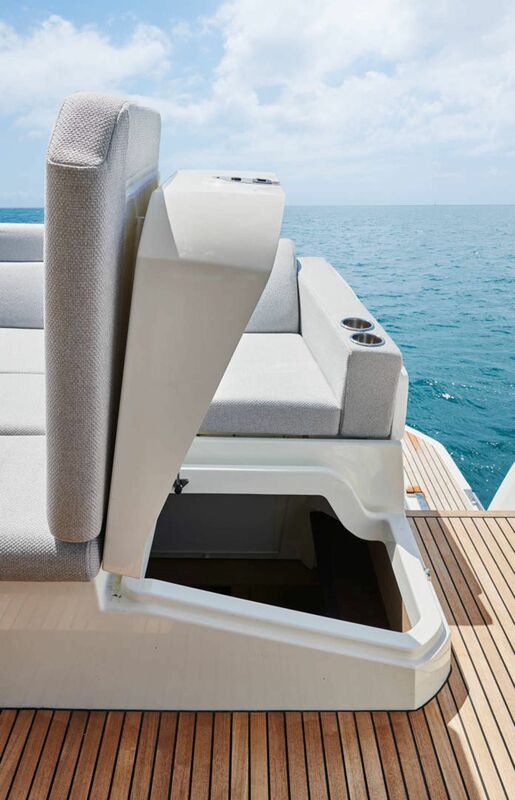 The front part of the Flybridge reserves space for sunbathing. 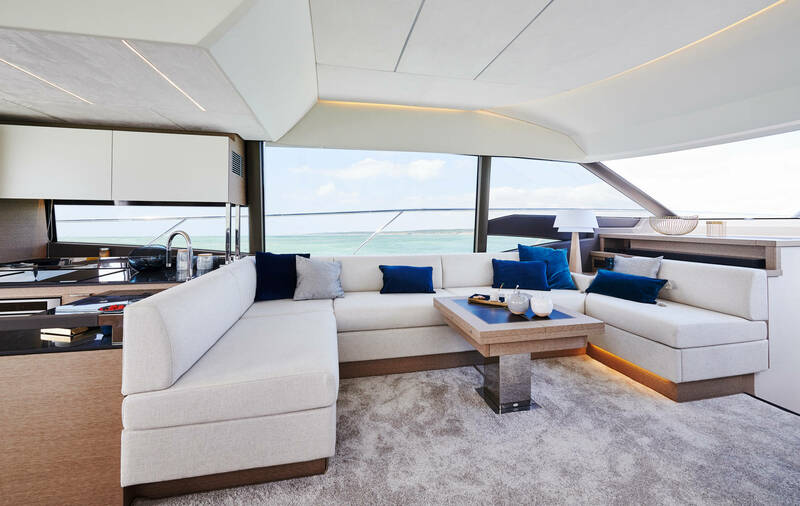 The lounge area of ​​the flybridge consists of a rounded L-shaped bench, a large table and the whole is served by a wetbar. 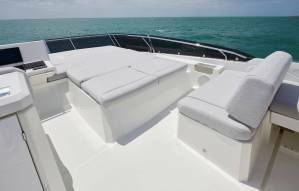 The cockpit has a seat that allows two people to sit there and opens harmoniously on the sun cushions. 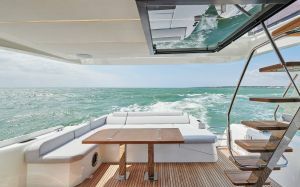 The aft cockpit opens fully onto the interior space. 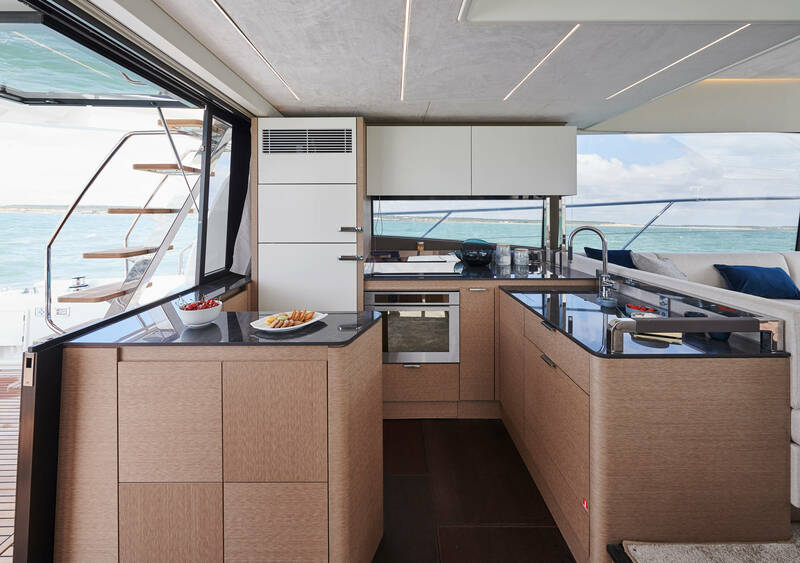 It should be noted the lack of steps when entering the boat through the sliding door and especially the central kitchen were very popular and received a very good reception from all boaters. 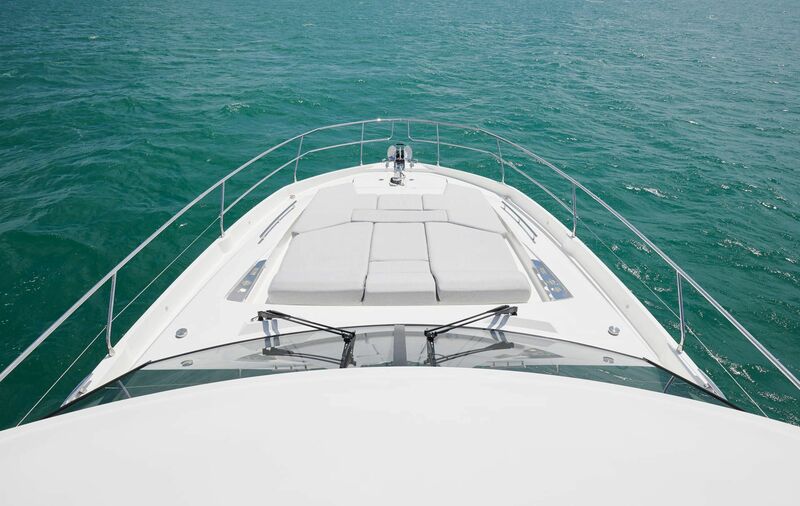 The proof, the immense success of the Prestige 500. Inside, the brightness is total, with very large windows and the opening directly on the cockpit. 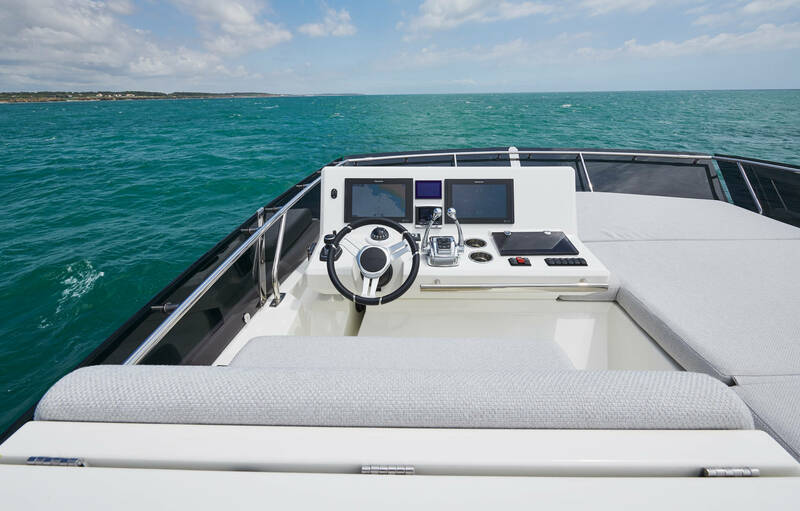 The side window near the cockpit facilitates navigation (in parking mode) and also allows access to the outside. 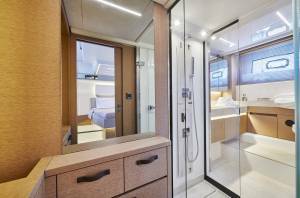 The launch of this new Prestige 590 is an opportunity for the French shipyard to operate a new upgrade. 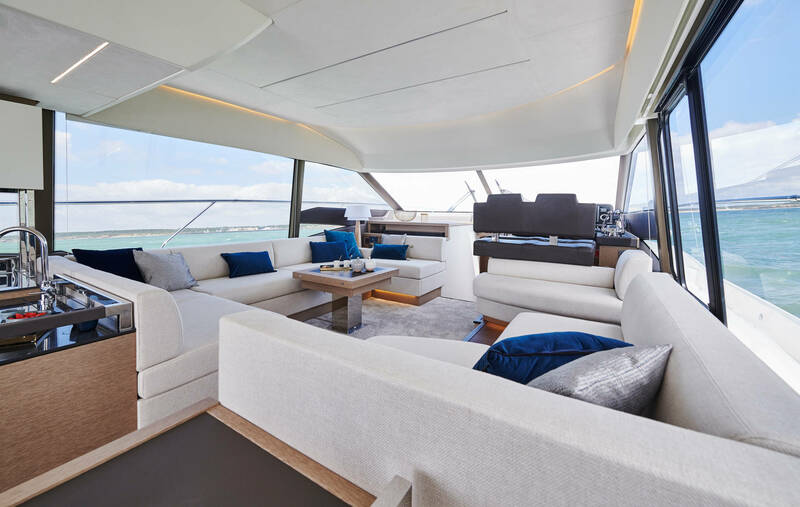 The rounded corners, comfortable sofas and vis-à-vis, warm and warm materials, contribute to a feeling of well-being, enhanced by a 360 ° visibility and with excellent brightness. 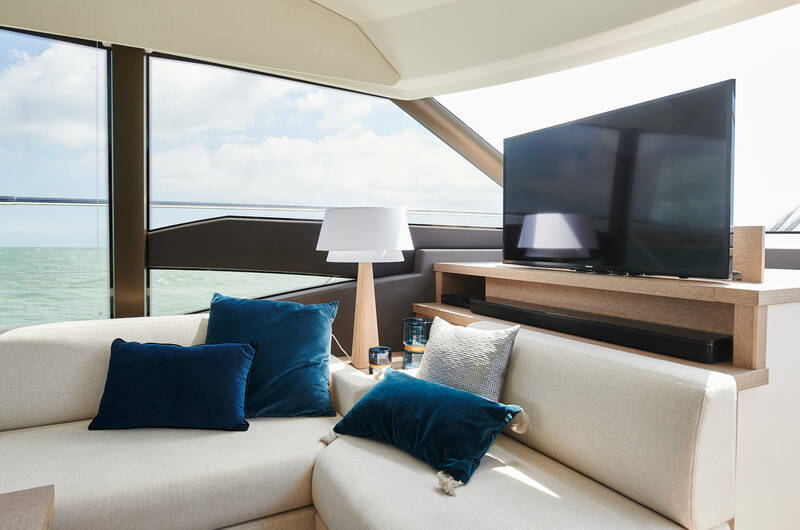 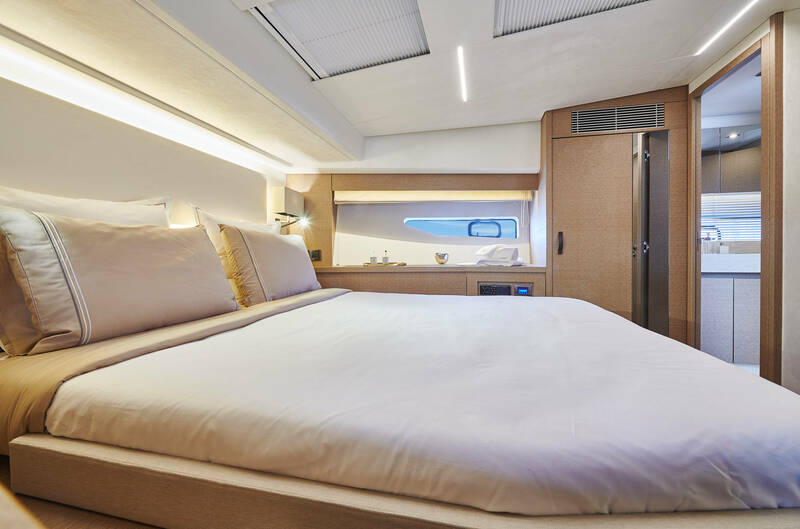 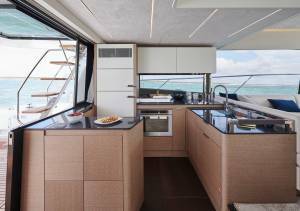 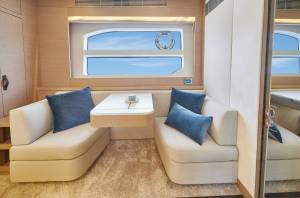 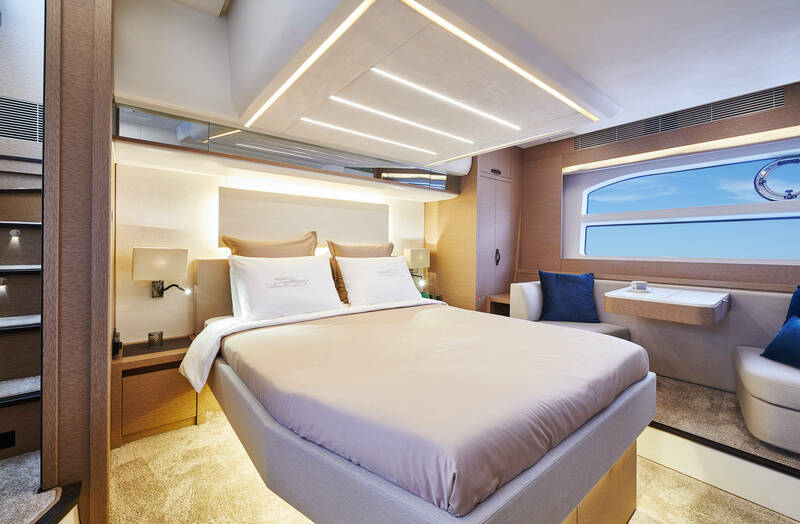 Thanks to an enlarged hull (hull), the sleeping area of ​​the Prestige 590 enjoys a vast height under ceiling and huge windows. 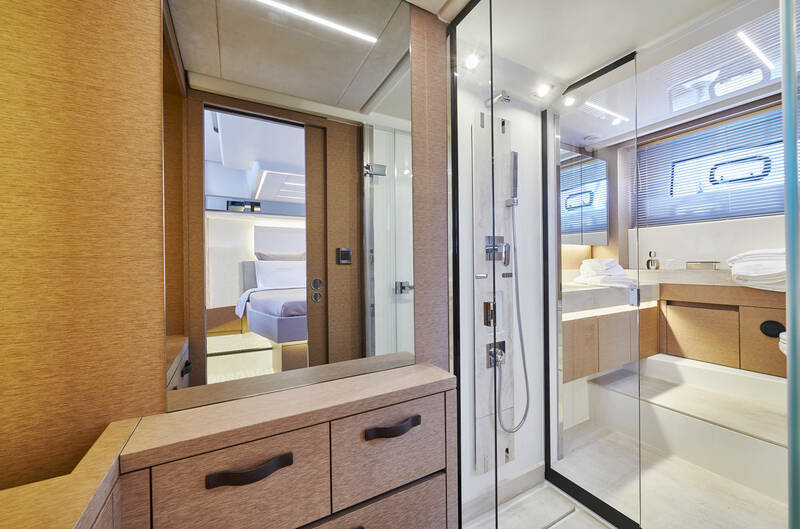 The owner’s cabin meets the PRESTIGE signature. It is accessed directly by an independent staircase. 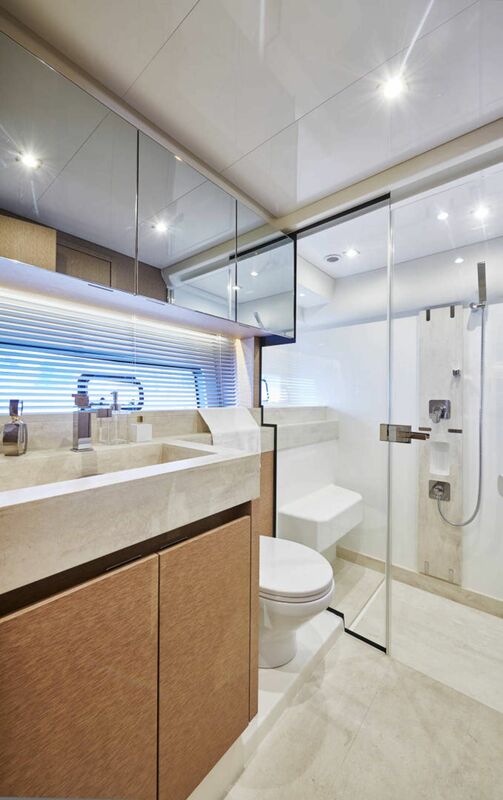 Very bright, the Master enjoys a bathroom really spacious, but also a spacious walk-in vis-à-vis. 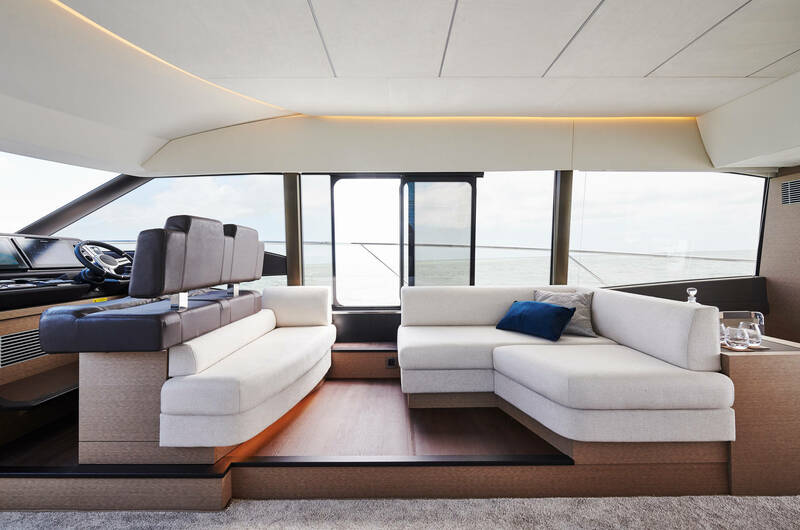 The model plays cleverly with the spaces and proposes 3 cabins. 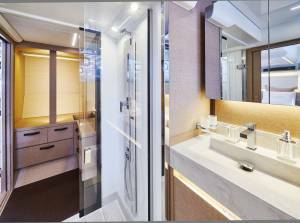 The walk-in can be configured in 3 rd bathroom, according to the preferences of the owner. 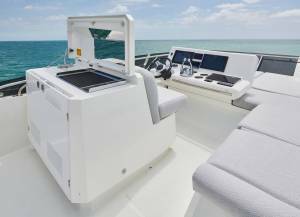 At 61 feet in length, this new model features a powertrain consisting of twin Cummins 600 HP engines equipped with Zeus Pods. This configuration inherent in the evolutionary V hull allows easy maneuvering with the joystick. 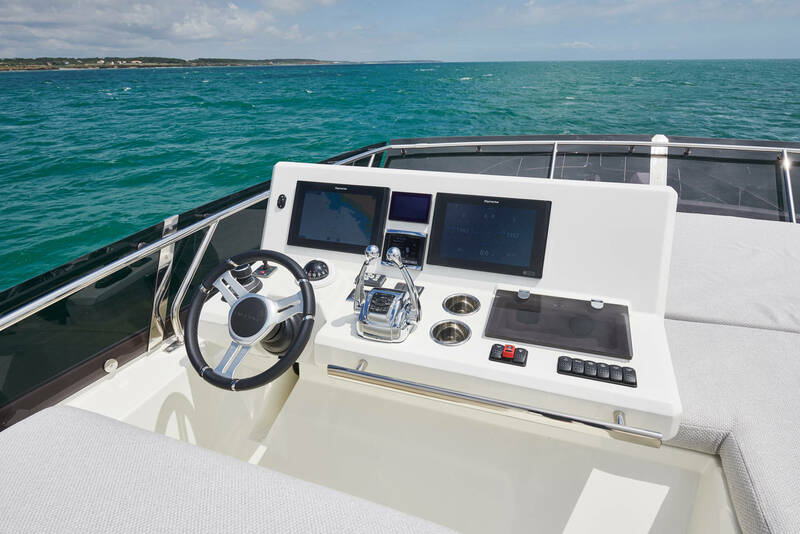 The reduction of noise and vibrations as well as reduced consumption add to the comfort and pleasure of sailing. 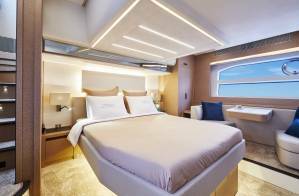 From a technological point of view, the innovative Prestige is the first model to adopt SHIP CONTROL. This networked system was created in-house to meet the needs of Prestige owners. All life on board is directly centralized and controlled via the navigation screens and it will be possible to do so also from a tablet. 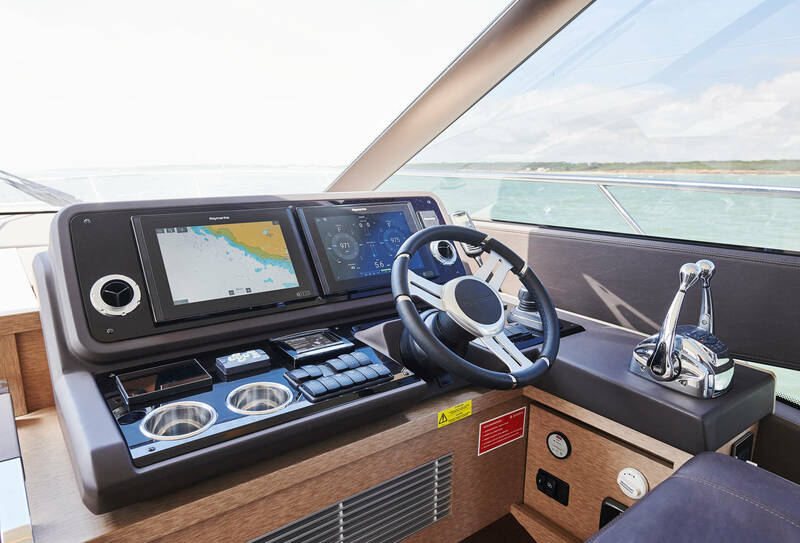 This overall monitoring of the boat represents a major advance in terms of life on board and everyday comfort according to Jeanneau. 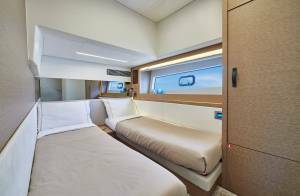 I would have liked to have a stronger motorization option and especially other than Pods Zeus. 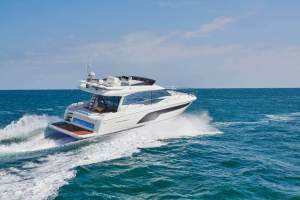 I would have liked to see the kind of hard top that will be offered as an option. I would have liked to see comfortable individual driving seats for the longest rides. 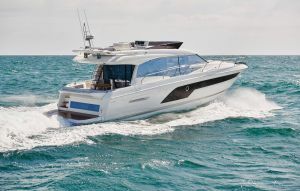 Searay L590 Fly: 64,000 lbs, width 16 ft. 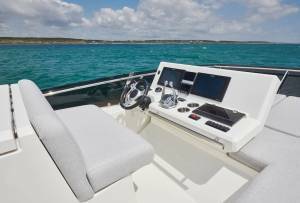 If you have any comments or requests, do not hesitate, the all team of Ita Yachts Canada Inc. are at your disposal.